The Johnston girls are the top dogs coming in to the 2018 cross country season, coming back from a 45 point win in 2017. After losing only one of their varsity athletes- Jessica McKee- who placed 3rd at the 2017 Iowa State Cross Country meet (2nd on their team), McKee's younger sister Brooke will look to fill her shoes after finishing just behind her last year. Also returning is 2017 State Champion Paige Horner and the rest of the 2017 varsity roster for the Dragons. With young, promising athletes like sophomore Bella Heikes and freshman Faith Nead, and the experienced junior Clara Toot returning, the Dragons will look for a three-peat State Championship win. The Waukee girls cross country team knew how to pull it together at the right time, placing 3rd at the 2017 State Meet with a score of 160. After being a solid force in our top 10 rankings throughout the season, they rose to the occasion at the State meet. All but one of their returning athletes from the 2017 team were freshmen or sophomores leaving a lot of great young potential to take over. With sophomore Peyton Kelderman and junior Sydney Schaffer returning, who placed 9th and 12th overall respectively, can they give the Johnston team a run for their money this year? 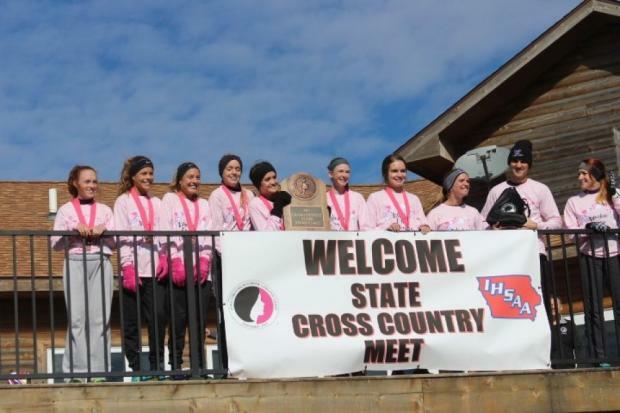 The Dowling Catholic girls cross country team was a strong force against the Johnston Dragons throughout the early 2017 season, but when it came down to the moment of truth at the State Meet, the Maroons ended up finishing in 8th place. With 5 of their top 7 athletes returning this year, including Kelsey, the younger sister of NCAA Champion Karissa Schweizer, and some great young talent coming up, can they rise to the occasion and crack the seemingly unbeatable Johnston team under the training of Coach Loran Storts in his second year as head coach?